Mmmm............. These beautiful Flupcakes look just fabulously delicious and incredibly yummy although, I dare say, perhaps wouldn't taste quite as good as they look. 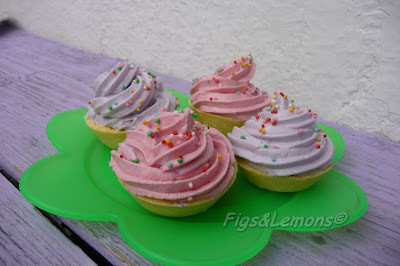 These gorgeous Flupcakes are made by a wonderfully creative artist, from http://figandlemon.blogspot.com/ who always uses colour and texture to create the most visually stunning soaps. Yes, these gorgeous lil' Flupcakes are actually soap. Whipped soap! Whipped soap is adored by kiddies (young and old) because they soap is so light, fluffy and, this is the best bit, it floats!! 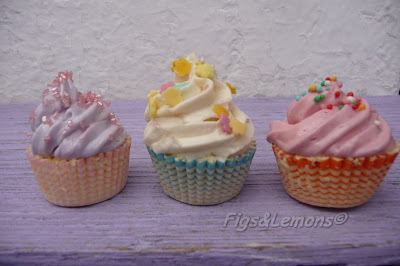 Yipee, never lose the soap again :o) These flupcakes are made extra special because they are finished off with Barbie sprinkles. Tell me, what girl wouldn't just fall in love with them? Balissimo! !